Do you have unsightly weeds in those cracks and crevices? Are the expansion joints in your sidewalk, driveway, patio or pool now rotten or missing? Why not replace them permanently with SlabGasket? SlabGasket is the perfect and cost effective replacement solution for rotten or missing wood. Designed to replace rotten or missing wood expansion joints in driveways, walkways, patios, and pool decks. Used in residential, commercial, and institutional applications. An extruded, flexible vinyl, the same material used in vinyl shutters, doors, windows, and siding. Immediately effective once installed. No waiting or curing is necessary. Rapidly installed, blending beautifully with the color of concrete. A cure for trip and fall hazards associated with empty expansion joints. 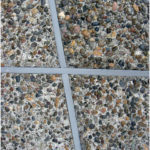 Helps prevent water from going under your concrete, which can erode dirt from underneath the driveway.